On 1st May 2014 Constance Briscoe, a barrister and Recorder (part-time Judge) was convicted of three offences of Perverting the Course of Justice and bailed overnight for sentence to be passed. We commented that it was an inevitable custodial sentence, in the order of 18 months. How did we do? The sentencing remarks are now available. We know that the Judge sentenced her to 16 months in prison, so we were not that far off the mark.The posts that we had linked to set out the various sentencing decisions that the Judge would have looked at (which is what we based our prediction on). This is a serious offence which almost always leads to a prison sentence. Here, there were a lot of personal circumstances that were good mitigating features, but these would be far outweighed by the seriousness of the offences. There had been speculation as to whether Ms Briscoe’s job as a barrister would have made the Judge go easier on her. It wouldn’t, if anything, it goes the other way. She, of all people, should have known that this was wrong. Also, Judges are aware that when they are sentencing ‘one of their own’ are acutely aware that the public are looking at them to see if they are lenient, and this often leads to a sentence higher than one would otherwise get. What next for Ms Briscoe? Her legal career is finished – there is no way that she will be allow to practice after this. Famously, in 2008 she won a libel trial brought by her mother in relation to her books. It has already been announced that this will be re-investigated. Whilst Mr Huhne may not particularly have the moral high ground, one can understand why he feels a bit aggrieved in the circumstances. Is he right that there will be a raft of convictions being found unsafe? Probably not. The Courts are generally very reluctant to go over old cases, and there was a warning last week from the Court of Appeal that this will be even harder in future. For any case to be successful actual prejudice would have to be shown – a situation where Ms Briscoe deliberately withheld evidence or lied to the Court (as two examples), to the detriment of a defendant. Similarly with case that she sat as a Judge over. This is very difficult from such a distance of time, and even if some failing can be picked out, a defendant would need to show that this may have impacted on the verdict – a very high task. Having said that, it is understandable that people who were prosecuted, defended or sentenced by Ms Briscoe may feel slightly aggrieved. This entry was posted in In the news and tagged constance briscoe, perverting the course of justice on 02/05/2014 by Dan Bunting. In the Spring of 2003 Chris Huhne persuaded his then wife, Vicky Pryce, to take his speeding points. This seemingly minor act would come back to haunt them ten years later. It’s effect went further than them and one of the major casualties was Constance Briscoe. On 1 May 2014 she was convicted of three count of perverting the course of justice. This is a very quick look just after the verdict is announced. We will look at this in more detail when the dust has settled and Ms Briscoe is sentenced. Between 16 May 2011 and 6 October 2012 you with intent to pervert the course of public justice, did a series of acts which had a tendency to pervert the course of public justice, in that you provided the police with two statements which were inaccurate. On 6 October 2012 you with intent to pervert the course of public justice, did an act which had a tendency to pervert the course of public justice, in that you produced a copy of your witness statement that had been altered and maintained that it was the correct version of that statement. A third charge was added during the proceedings that related to the falsification of a document. In 2011 when the police were investigating the Huhne case they took two witness statements from Ms Briscoe (a neighbour). In this she indicated that she ‘held them in the same regard’ and that she had not had any contact ‘whatsoever’ with the press. This was incorrect in that Ms Briscoe was a confidant of Ms Pryce and was discussing matters with the Mail on Sunday. When “Ms Briscoe was later interviewed by police following her arrest, she pointed out an alteration in her statement, claiming it changed the meaning, the court was told”. This triggered the third allegation. A copy of the statement was given to an expert witness instructed by Ms Briscoe’s legal team and it was alleged that the wrong one was deliberately handed to the expert in order to get favourable evidence. Ms Briscoe accepted being an intermediary between Ms Pryce and the Mail on Sunday, but stated that the relevant part of the statement had been added by the Police by the mistake. Why is she called a ‘top Judge’? This appears to be an unwritten rule of journalism. Any barrister must be reported in the press as a ‘top brief/barrister/lawyer’, and most often a QC (even if they’re not). For the same reason, there’s no such thing as a mere ‘judge’, everyone is a top judge. It’s just one of those things – I don’t make the rules. Perverting the course of justice almost always results in a custodial sentence (see the factsheet above). Vicky Pryce got 8 months and this would appear to be, on the fact of it, far more serious than that. The fact that Ms Briscoe is a lawyer will not help her (if anything, it aggravates it). Barring some exceptional circumstance, it would seem quite clear that the result will be a custodial sentence. Based on the seriousness of the offences, we would expect the court to start at somewhere in the region of 18 months, before considering any mitigation. She will be sentenced on Friday 2 May 2014. What happens next for her? She will be sentenced shortly and will not doubt be considering an appeal. We’ll have a look at the case in more detail shortly. Her legal career is finished following this conviction. There are instances of Judges being found guilty of criminal offences (common assault as an example and, more recently, failing to control a dog), but this is in a different league. It is also, as far as we know, the first time a Judge in England and Wales has been convicted of Perverting the Course of Justice. This entry was posted in In the news and tagged briscoe, constance, constance briscoe, guilty, judge guilty, perverting the course of justice on 01/05/2014 by Lyndon Harris. Defence solicitor Basharat Ditta was imprisoned for three years on Friday 1st November, having been found guilty of attempting to pervert the course of justice. Ditta was found to have passed on sensitive police intelligence to his client Neil Scarborough, who was facing a conspiracy charge relating to drug smuggling. Ditta passed on sensitive information about Scarborough’s co-conspirators in an attempt to divert attention away from Scarborough. 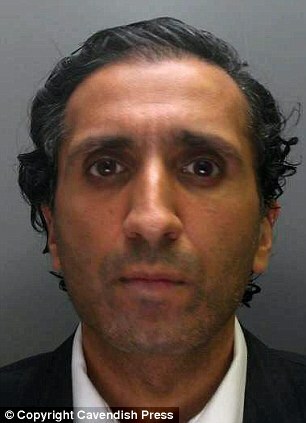 Hair analysis showed Ditta to be a user of cocaine and Scarborough was said to be his supplier. Supt Lee Halstead said the 44-year-old’s cocaine addiction had left him “hopelessly compromised”. Scarborough later pleaded guilty to a charge of conspiracy to supply heroin, cocaine and cannabis, and was sentenced to fourteen years in prison. Thirty-five other men were also jailed. Ditta denied any wrong-doing was convicted of the charge after trial. “The role of the criminal solicitor is a demanding one. Those who carry out such work understandably wish to maintain a good relationship with their clients, many of whom can be demanding and at times unreasonable. This entry was posted in In the news and tagged Basharat Ditta, Conspiracy, perverting the course of justice on 04/11/2013 by Sara Williams. 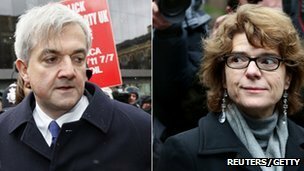 Chris Huhne and Vicky Pryce were sentenced this afternoon by Mr Justice Sweeney to 8 months and 8 months imprisonment respectively. Chris Huhne received a 10% deduction for his plea of guilty. The key information is available here, including the facts, the abuse of process applications and those infamous jury questions. There is also a brief look at the sentences for such cases – and a prediction. After setting out the facts of the offence and the history of the proceedings, the Judge noted that whilst this was a huge tragedy and fall from grace for them, “any element of tragedy is entirely your own fault“. He then noted that there were no guidelines for the offence, but that this sort offending inevitably carries a custodial sentence unless there are exceptional circumstances. And in this case, those circumstances did not exist. In relation to Chris Huhne, the Judge stated that the offence was his idea which made him more culpable (but not by much). Taking into account the delay before his sentence and the impact on his career, the starting point would be 9 months in prison. Given his late guilty plea, the actual sentence would be 8 months. In relation to Vicky Pryce, the Judge stated that in his view she was marginally less culpable and noted that this would have a catastrophic effect on her. However, there was no genuine remorse and nothing that could mean that the sentence could be suspended. For that reason, she also was sentenced to 8 months. Neither have spent any time on custody, so the sentence of 8 months will start from today. The normal rules mean that they will have to serve half of that – so 4 months. They will both be eligible for HDC (early release on a tag) which means, in this case, they could be released after two months. Given their age and personal background it’s highly unlikely that they will be in trouble again. Also, they clearly do not present any violent or sexual risk to the public, so it is almost certain that they will be released on a tag in 2 months. In relation to Ms Pryce, we do not know if she will appeal to her conviction. As to the sentence – it is above the usual sentences given for this offence, but not by much. For this reason, whilst it may be that both will appeal, we would not expect their sentence to be reduced. Which prison will they go to? Overnight, it will be the local prisons, probably Wandsworth for Mr Huhne and Holloway for Ms Pryce. Given that the sentences are quite short, it may be that they are kept there for the whole sentence (see here for an overview). If they are moved then they will both by Cat D.
This entry was posted in Current Awareness, In the news and tagged Huhne, perverting the course of justice, Pryce on 11/03/2013 by Lyndon Harris.